The Gurkha Shaggy is one very cool cigar. Complete with a shaggy foot, this smooth and creamy smoke has hints of cedar and spice from first light to last ash and with a hazelnut undertone it should always have a spot in your humidor. The Gurkha Vintage Shaggy is as quirky and groovy as Shaggy from Scooby Doo. 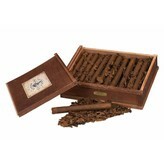 This cigar from Gurkha is an experience that should not be missed. The unique Gurkha Vintage Shaggy features an unfinished shaggy or exposed foot. Handmade in Honduras, the Vintage Shaggy is comprised of well-aged Dominican long fillers and binder encapsulated in a Dominican wrapper creating a medium to full bodied balance of flavor. The 5 year aged tobacco creates delicious notes of cedar, spice and a hint of hazelnut to dazzle the palate finishing with smooth and creamy vanilla. At your next gathering with friends and family impress them with a pairing of Gurkha Vintage Shaggy and a great bourbon whiskey. Early Times 354 Kentucky Straight Bourbon Whiskey from Brown-Forman Distillery in Louisville has a rich amber appearance with notes of flavorful spice, oak, fruit and a layer of caramel and vanilla. The mellow Early Times is an easy-to-drink whisky, both straight and mixed. Let’s mix it up, Scooby! Just kidding! Don’t attempt this pairing. Try this refreshing cocktail instead, at your next party. Add bourbon, grapefruit juice, lemon juice, and Amaro to a cocktail shaker. Fill 2/3 full with ice and shake until well chilled, about 15 seconds. Strain into a cocktail coupe, garnish with lemon twist, and serve immediately. CHEERS!